International ice dance sensation The Imperial Ice Stars return for a third triumphant season to 4000 square feet of ice at the Royal Albert Hall, for 12 performances only. Nutcracker on IceAs midnight strikes on a magical Christmas Eve, a toy Nutcracker comes to life, sweeping young Marie to a world of enchantment where she meets the Mouse King, the Nutcracker Prince and, of course, the Sugar Plum Fairy. Set against a backdrop of colourful projections, opulent costumes, magic tricks and special effects, the cast of World, European and National Championship level skaters dance to Tchaikovsky’s glorious score performed by a live orchestra. Breath-taking high speed leaps, heartstopping throws and awe-inspiring acrobatics combine with sublime ice dance to make The Nutcracker on Ice a festive treat that will thrill and enchant all ages. Set in early 1900s St Petersburg, The Nutcracker on Ice boasts sumptuous sets by leading Australian scenic designer Eamon D’Arcy in this his fourth Imperial Ice Stars show, opulent and stylish costumes from renowned Russian designer Albina Gabueva who created the sophisticated costuming seen in Cinderella on Ice and Swan Lake on Ice, and magical special effects. This brand new production follows the classic Russian tale of Maria, the little girl whose love brings to life her cherished Nutcracker doll – a magical Christmas gift from her mysterious godfather – leading to adventures with the Mouse King, the enchanted Prince, and the Sugar Plum Fairy. The story was originally penned nearly two centuries ago, in 1816, by the German author E T A Hoffman, and was later adapted by the French writer Alexandre Dumas in 1847. From this adaptation, the Russian composer Pyotr Ilyich Tchaikovsky and choreographer Lev Ivanov created their ballet, The Nutcracker, which was first performed in St Petersburg in 1892 and has since become a perennial Christmas favourite the world over. 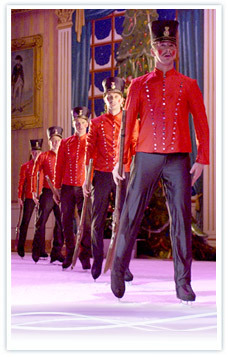 The Nutcracker on Ice will thrill and enchant all ages. It is a cold Christmas Eve in the Russian city of St Petersburg, as the nineteenth century nears its close. In the warm glow of the Romanov family home, the childish laughter of young Alexander and Maria Romanov and their friends is heard, as they excitedly unwrap Christmas presents of colourful toy soldiers, beautiful dolls, and, to the disdain of the adults, noisy drums and trumpets! What would it be like if the world was covered in ice and we skated around without car troubles or traffic jams? Well, until climate change takes inspiration from Michael Bay, we’ll have to leave that question to our imaginations. And nowhere is it more wonderfully imagined than in The Nutcracker On Ice, showing at the Artscape, Cape Town until 12 February, 2012, after playing to sold-out audiences in Joburg last year. A great Christmas Eve party commences. Handsomely dressed men enjoy a tankard of hot punch, while others proffer their arm to attractively dressed ladies as an invitation to dance the waltz. However the atmosphere changes when the mysterious figure of Herr Drosselmeyer dramatically enters and starts to perform his famous magic tricks – with alarming results. There is a feeling of unease, as his presence gives off a strange foreboding. Then to Maria’s delight, Drosselmeyer presents her with a Nutcracker Doll. But this is no ordinary doll. Not only can it crack nuts, but its charm and mystique soon has Maria enchanted, almost mesmerised by its very presence. After the partygoers say their good-byes and travel homewards over moonlit snow, Maria, disturbed from her sleep, hurries downstairs, compelled to check on her beloved Nutcracker Doll. She trembles with fright as flashes of lightning illuminate the darkened room, followed by hideous claps of thunder. Maria stares in disbelief as the furniture mysteriously grows in size. Just what is happening? Her fear becomes more intense as giant mice, led by the ruthless Mouse King, surround Maria and prepare to attack. To her relief the toy soldiers spring into life and march to her defence. A terrifying battle commences as mice and soldiers fight back and forth across the drawing room and around the Christmas tree. Surviving the ordeal, Maria’s love for the Nutcracker releases him from an evil spell and he is transformed back into a handsome prince. The Prince takes Maria on a long journey to a beautiful snow covered fir forest and the Land of Snowflakes. They journey onward to his kingdom in the Land of Sweets – a child’s paradise where everything you see you can eat, such as delicious Butterscotch Cobbles and Peppermint Twirls.The Prince introduces Maria to the Sugar Plum Fairy. To celebrate the homecoming of their beloved Prince, the Sugar Plum Fairy organises a ‘Grand Celebration of Dancing’. To Tchaikovsky’s magnificent music, the delightful host of the celebration performs her famous Dance of the Sugar Plum Fairy, and the grateful Prince performs a solo dance in response. This commences with Le Chocolat, a group of dancers from Spain, who with skirts swirling and castanets clicking, perform to the rhythms of exciting flamenco music. The country of China then entertains as a couple wearing exotic silk pyjamas perform the Tea dance. They are followed by Le Café from Arabia who perform a stunning dance in the air. Next comes the Dance of Russia with four Cossack dancers performing energetic acrobatic feats. Finally there comes a plea from a couple of surprise guests. The dancing culminates in the beautiful Waltz of the Flowers, full of swirling colour and graceful movement. After all their adventures, Maria and her Prince have fallen deeply in love. To everyone’s surprise the Mouse King reappears , but is it really him, and were Maria’s adventures just a magical Christmas Eve dream – or did they really happen…? Nearly two centuries ago, in 1816, the German writer E.T.A Hoffman published a story called The Nutcracker and The Mouse King, telling the tale of how a little girl’s love bought to life her cherished Nutcracker, an enchanted Christmas gift from her mysterious godfather. This work was a morbid story, never intended for children, which portrayed a bleak view of humanity and relationships. In 1847, the French writer Alexandre Dumas published a retelling of Hoffman’s story, lifting the mood of its somewhat dark and disturbing predecessor into a story for children. In 1891 the legendary choreographer Marius Petipa of the Russian Imperial Ballet, commissioned composer Peter Ilyich Tchaikovsky to write the score for a new ballet based on this adaptation of the Nutcracker story. Tchaikovsky struggled to write the piece, possibly due to the strict parameters imposed upon him by Petipa, who gave him highly detailed instructions, including the types of music, rhythm, tempo, and number of measures for each dance. Tchaikovsky left for the USA with the work unfinished, but later returned to France and continued with the score, finally completing it in Russia under a cloud of scandal regarding his alleged homosexuality. In order to save time, Tchaikovsky drew from some of his earlier compositions, for example, some sections of the snow scene resemble parts of his Fourth Symphony. Likewise, the battle with the mice contains many similarities to his famous 1812 Overture. Before The Nutcracker ballet was completed Petipa withdrew as choreographer because of illness and was replaced by Leve Ivanov, who is now generally credited with the choreography. The Nutcracker ballet premiered in St Petersburg in December 1892. As popular as this ballet is today, it is difficult to imagine that this first production was not a success. The audience gave the new work a lukewarm reception, claiming the story was weak and the score was disjointed, with its lush orchestration too overpowering for the dancing. Many had difficulty in reconciling the Act I narrative with the Act ll divertissement. Critics slated it both musically and choreographically and The Nutcracker closed after only 14 performances. However, the enchanting and magical story of The Nutcracker has endured and remains throughout the world one of the most popular ballets. Tchaikovsky created three ballet masterpieces, all of which were not only of unequalled scope for their time but which have become modern-day cornerstones of ballet repertoire. The popularity of Swan Lake, The Sleeping Beauty and The Nutcracker are beyond question, even if initial reactions to them were far from laudatory.